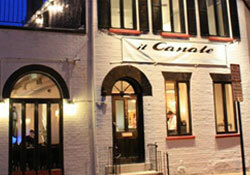 Located in the heart of Georgetown, il Canale offers the most authentic Neapolitan pizza in DC, thin-crust made by our Italian pizzaiolos cooked in a wood-fired oven imported directly from Italy. The kitchen, led by Naples-born Antonio Biglietto, offers a menu that brings our native country to your table with every selection--antipasti, pastas, seafood, meat, fresh Bufala mozzarella from Italy, and so much more. The attractive blue-lit, full bar specializes in carefully selected Italian wines. In warm weather, dine alfresco at the sidewalk tables or on the roof-top terrazza overlooking the Georgetown scene.